Trans-Allegheny Lunatic Asylum and the Haunting Enigma of Lily What came first, the story or the ghost? 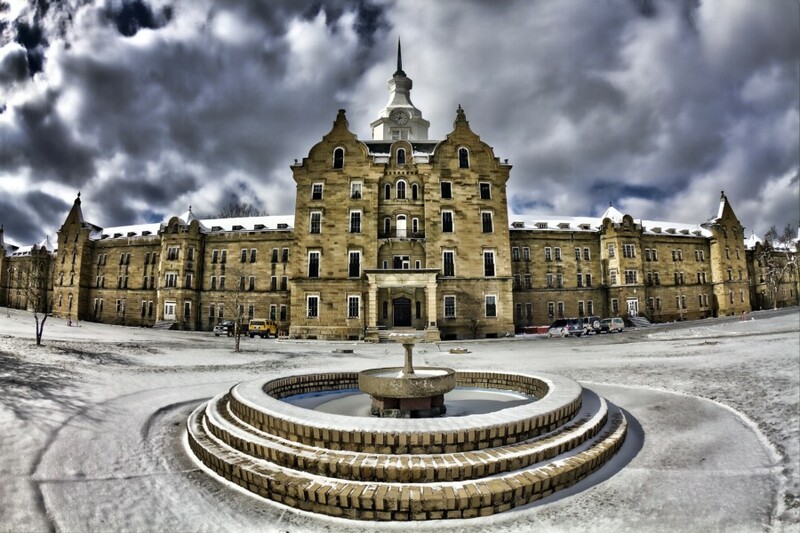 Trans-Allegheny Lunatic Asylum, previously known as The Weston State Hospital, or the West Virginia Hospital for the Insane would be intimidating even without the ghosts. Its monumental main structure, the largest hand-cut stone masonry building in North America, divides 242,000 square feet over four floors, is a staggering 1,296 ft long, and is outfitted with 921 windows and 906 doors. A 200-foot tall clock tower stretches up from the center like a hand reaching to God. The walls are two-and-a-half feet thick, dense enough to muffle the screams of even the most tormented soul, alive or dead. 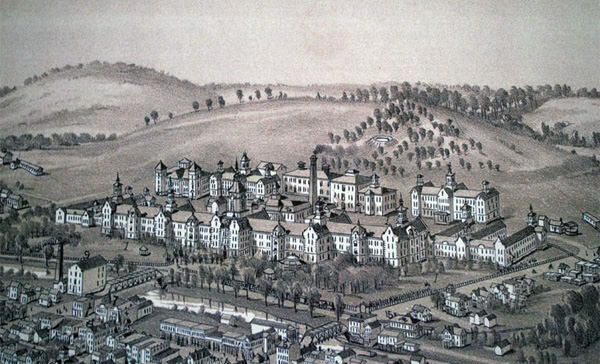 In the wake of a reformist wave propelled across the land by remarkable mental health crusader Dorothea Dix, the Virginia General Assembly allocated the princely sum of $125,000 to build the Trans-Allegheny Lunatic Asylum in the early 1850s, purchasing 269 acres along the West Fork River opposite downtown Weston. Dr. Thomas Kirkbride, whose thinking dominated the physical design of asylums and care for the mentally ill in the United States for half a century, was hired as advisor. Renowned architect Richard Swoden Andrews designed the Gothic/Tudor blue sandstone structure following the “Kirkbride Plan“: long wings in a “shallow V” formation, arranged “en echelon” (staggered), so all patients had access to unobstructed sunlight and fresh air. The building itself was meant to be “a special apparatus for the care of lunacy,” supported by “highly improved and tastefully ornamented” grounds. Kirkbride, a humanist and the first doctor in the United States to recognize mental illness as a disease that could potentially be cured, believed that those afflicted were “not disabled from appreciating books … nor from enjoying many intellectual and physical comforts,” and with institutionalization central to his Plan, he sought to create an egalitarian environment where patients would be treated with dignity, compassion, and respect. Construction began in 1858 on the main structure, known as the “Kirkbride Building,” but came to a screeching halt when the Civil War broke out in April of 1861. Border state Virginia was deeply divided culturally and economically. Most people in the western part of the state were Appalachian mountain folk, not plantation owners, who had little need of slaves and were generally unable to afford them anyway. In June of 1861, Virginia officially seceded from the Union, throwing itself into the bloody struggle. West Virginia then seceded from Virginia, remaining with the Union. The war literally marched into Weston on June 30, 1861, when the 7th Ohio Infantry, led by Colonel Erastus Bernard Tyler, swept into town, ostensibly to round up Confederate sympathizers. But Tyler’s underlying motive was revealed when he sent the trusted Captain List and two armed soldiers to the Weston branch of the Exchange Bank of Virginia, where they seized $27,000.00 (over $500,000 today) in gold coins being stored in the bank vault for the purpose of covering asylum construction costs. Banker Robert McClandish, summoned to open the vault, couldn’t dissuade Captain List from his appointed mission, but did negotiate to retain $2,371.23 already owed to creditors. The bulk of the cache was sent to Wheeling, where it helped fund establishment of the new state of West Virginia. The 7th Ohio then tromped over to the partially constructed asylum and established Camp Tyler, a Union post strategically located near several important roadways. The completed southern wing of the asylum provided barracks, and the main foundation served as a stable for horses. Confederate raids in 1862 and 1863 temporarily disrupted Union control, and in 1864 raiders confiscated $5,287.85 from beleaguered banker McClandish and stripped the asylum of all food and clothing intended for its first batch of patients. The hospital admitted its first patients in 1864, though construction continued until 1881. With the war over in 1865 and the soldiers gone, building on the asylum boomed, saving the Weston area from post-war economic depression. The Asylum would remain the economic heart of Weston until it closed 130 years later. As responsibility for the unproductive, noncompliant, mentally impaired, and genuinely mentally ill shifted from families and private organizations to the state, asylums like TALA became dumping grounds for the damaged and unwanted. Originally designed to house 250 with privacy and comfort, the hospital held 717 patients by 1880, 1,661 in 1938, over 1,800 in 1949, and a dangerously overcrowded 2,600 in the 1950s. In keeping with the Kirkbride ideal of self-sufficiency, and to keep up with a growing population, more buildings began to sprout up within the property, including a greenhouse that supplied fresh produce, a geriatrics center for the elderly and those suffering from dementia and Alzheimer’s, a large kitchen facility and cafeteria, a building for the court-ordered criminally insane, and a state-of-the-art medical center complete with morgue and autopsy room. TALA also had a separate tuberculosis building. Due to the contagious nature of the disease, it was necessary to keep these patients isolated from the general population. This building differed in design from the others with its open-aired wings and screened in sun porches. Today, this building remains relatively intact and hosts the local Halloween Haunted House attraction each fall. The growing community of the Trans-Allegheny Lunatic Asylum encompassed more than just the land on which it sat. TALA was the main employer for the city of Weston. It was a symbiotic relationship, with the hospital dependent on the city for its supplies and employees, and the town economically tethered to the hospital. Everyone benefited from this relationship except for patients, who, crammed into an overcrowded, understaffed, under-funded facility, cried out for help, and in some cases justice. Death was no stranger to TALA and several murders were committed inside its walls. The deteriorating hospital, designated in 1990 as a National Historic Landmark, became unsupportable and mercifully closed its doors in 1994. The facility sat abandoned for years, a deteriorating eyesore in the community whose economy had revolved around it for so long. Finally, the West Virginia Department of Health and Human Resources put TALA up for auction in 2007. Contractor Joe Jordan made the winning bid of $1.5 million with the intention of revitalizing the property while preserving as much of the history as possible, but a series of fires and code violations thwarted his plans for a successful historical facility. Those who spent time in the building regularly reported seeing apparitions of nurses, doctors, and patients roaming the staggered corridors; and hearing anguished cries echoing through the hallways. Taking a cue from shuttered institutional facilities like the Ohio State Reformatory and Waverly Hills Sanatorium, Jordan began offering historic tours and overnight ghost hunts, folding revenue back into the facility for repairs and restoration. As its reputation quickly spread, TALA attracted the attention of the media. The TAPS team from Ghost Hunters filmed and investigated TALA in 2008, and Ghost Adventures followed in 2009 with a live televised seven-hour investigation on Halloween Eve. Both teams believed the building to be haunted, and there have been countless subsequent reports of ghostly activity at TALA by visitors and staff. Thousands of suffering souls entered the hospital, seeking refuge or salvation; others were dumped there, thrown away like unwanted trash. With such a thick mixture of energy and emotion, it’s no wonder TALA offers a rich potpourri of paranormal phenomena. The lonely spirit of a young girl named Lily wanders the halls, looking for a playmate. She makes herself known to visitors in several ways, including interacting with a menagerie of toys set out in the room dedicated to her memory. 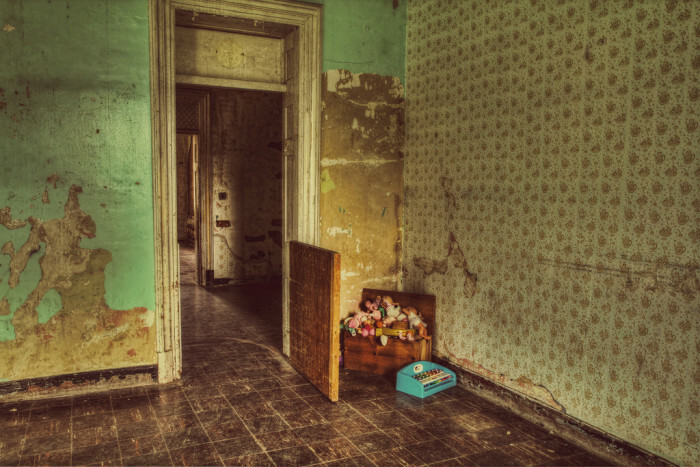 But Lily isn’t the only child at TALA – ghosts of many of the hospital’s younger residents haunt the upper floors, sometimes following visitors throughout the building, even following them home. The Civil War left more than scars behind in Weston. Tortured moans of the wounded, heavy-booted footfalls, misty forms, and ominous shadows permeate the Civil War section of the building. Nor are the upper floors as vacant as they seem. The spirits of at least two vicious murderers remain, trapped in an earthly purgatory for their crimes. Slewfoot, a cunning psychotic, murderously lashed out in a lavatory; the phantom of an even-more depraved, unnamed multi-murderer haunts the dungeon-like seclusion cells. Some of the most despondent asylum patients thought suicide a way out, but they too remain stuck indefinitely between this world and the next. Their desperation seeps from the walls like water from broken pipes. 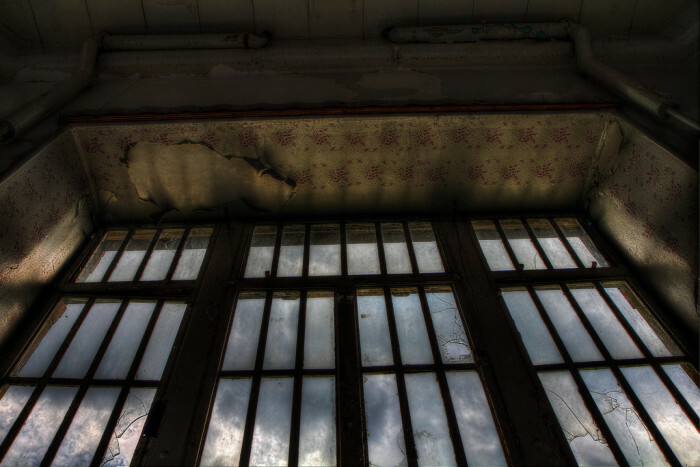 Guides and visitors feel that some spirits come and go, perhaps using the facility as a doorway; some stop by for a short while before passing on to other destinations, while others cannot or will not move on, embedded in the very foundation of the asylum. A still controversial treatment was used extensively at the hospital. The “ice-pick” (transorbital) lobotomy was a crude procedure where a sharp one- or two-pronged device was driven through the orbital socket of the eye and into the brain with a sharp blow, causing permanent damage thought to relieve some of the patient’s more severe symptoms. In 1952, one doctor performed 228 such lobotomies during a two-week period in West Virginia. The aptly named “Operation Ice Pick” became part of the grisly legacy of Dr. Walter Freeman, TALA’s most notorious doctor. “I’m not sure where it all started, but… Lily talks,” explained Zach McCormick, former TALA tour guide and paranormal enthusiast. The most popular area on the first floor is Lily’s Room, located in the eastern corner of Ward Four, a “step” between Ward One and the older Civil War section. The staff has turned this room into a sort of shrine to their resident spirit, honoring her life and memory. Legend has it that Lily was a little girl who spent all or most of her short, sad life inside the walls of Trans-Allegheny Lunatic Asylum. Some believe she was dropped off at the hospital, like an unwanted stray, by parents who couldn’t or wouldn’t care for her. Another story has it that she was born at the hospital shortly after her mother was committed, taken in and cared for by hospital staff until she died tragically of pneumonia at the age of nine. After her death, her spirit remained inside TALA, the only home she had ever known. The most active of all the ghosts in the hospital, Lily likes to play games with visitors and has become especially close to some of the current guides. 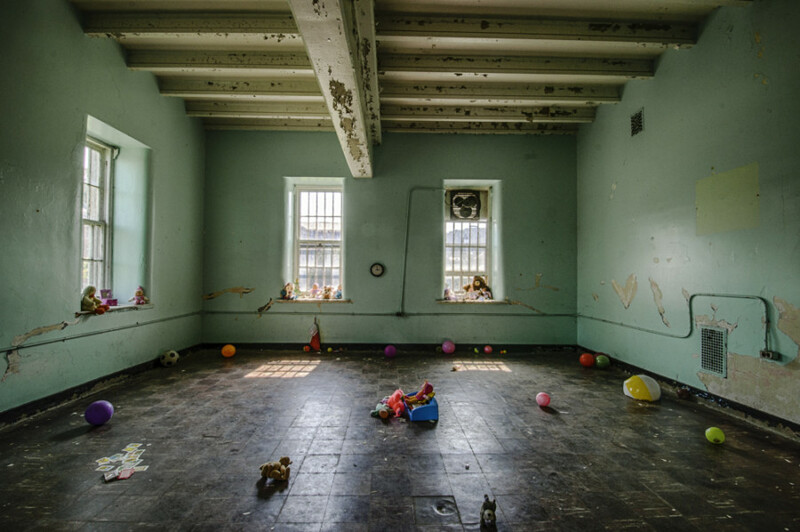 Her room is a cheery yellow, one of the brightest in the building, although the peeling walls and broken window glass remind you that no living soul occupies this space; and the iron bars on the windows are a stark reminder of the bygone realities of asylum life. The room is stocked with a variety of toys, including a pink-and-white music box with a miniature ballerina turning point to a tinkling lullaby when the box is opened. The music box sometimes decides to play on its own. Other items, such as baby dolls and plastic bouncy balls, are scattered about the room. These toys, set out as an invitation to play, have been known to move by themselves or in response to commands. Lily will, on occasion, roll the ball back and forth with visitors in an eerie game of catch. Lily seems to delight in these ghostly play dates and visitors often hear her giggles — equal parts sweet and spine-tingling — echoing down the halls. TALA guides have developed a special protective bond with the girl’s spirit, demanding that she be treated with kindness and respect. Lily remembers and favors frequent visitors, interacting with them in specific ways. Paranormal investigator Aaron Sulser has investigated the asylum a dozen times. He claims one of Lily’s favorite games involves the music box and flashlights. During a recent session Aaron asked Lily if she remembered him, and if so, to please make herself known. He placed flashlights in different areas of the room, set up so that a slight twist on the top would turn them on or off. Aaron wound the music box and began asking questions. A flashlight turned on, indicating Lily was there. As the music slowed the flashlight dimmed, only to return to full brightness when the music box was wound again. This occurred several times throughout the session. When Aaron asked if Lily was making it happen, he got a positive response. The correlation between the music box and the flashlight was so consistent, Aaron had no doubt Lily was manipulating it. Lily’s Story – Fact or Fiction? Lily’s life story is ambiguous at best. Where did the “facts” of the Lily stories come from? 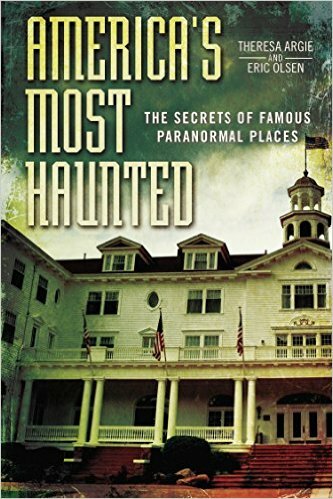 According to an April, 2010 episode of Ghost Stories, a paranormal investigation series that aired on Travel Channel, psychic Tammy Wilson first discovered the spirit of a small child named Lily on a tour of the asylum. The girl was about nine years old, wearing a white dress. Her mother, first name starting with the letter “E,” an only child of a prominent family from England, was brought to the hospital already pregnant. E was told her parents were killed in an accident and couldn’t come back for her. She had to remain at the asylum, where she gave birth. Both mother and daughter lived the remainder of their days at TALA. According to the producers of Ghost Stories, patient records from the 1920’s showed a woman, first name beginning with “E,” was admitted to the hospital while pregnant and later gave birth, possibly a girl, possibly Lily. The show also interviewed local historian Shelley Bailey, who claimed to have encountered Lily several times, leaving small gifts for her such as toys and a box of Cracker Jacks, which moved on its own. She heard the distinct sounds of a box opening and crunching coming from the same area. A captured EVP politely said, “Thank you for the snacks.” Shelley and her companions claimed they played a game of catch with Lily, using a plastic ball that bounced back and forth for almost 45 minutes. Another interesting account (in which her name was spelled “Lilly”) first appeared on the Internet in October of 2009. In 1863, a woman named Gladys Ravensfield, abandoned by her husband, was admitted to the hospital after being savagely and repeatedly raped by a group of soldiers. Gladys was not only traumatized by the assault, but also found herself pregnant. Taken to TALA, she slipped deeper into madness, rocking robotically back and forth for hours. Gladys gave birth to an infant girl who survived only a short while. In this version, the staff at the hospital felt the spirit of both mother and daughter never left. Lily, the name given to the child, actually grew up there, even if only in spirit form. She plays games with guests and has a fondness for sweets. Lily’s tiny hand reaches out for someone to hold. Her mother’s benighted spirit is locked forever in a state of shock and despair. What’s fascinating about this version of Lily’s story is how quickly it spread and was taken as fact. The author, Stephen Wagner, About.com’s Paranormal Phenomena guide, created it for an Internet promotion that invited bloggers to create a short fictional story about a ghost or event that occurred at TALA to help promote the Ghost Adventures live seven-hour TV event, which aired October 30, 2009. However, the story spread across the Internet as a “historical account,” a graphic reminder that just because something is posted on the Internet (or shown on reality television) doesn’t mean it is true. Accounts should be confirmed from multiple sources – ideally from the original source — before a story is taken at face value. Ironically, though a wonderful research tool, the Internet has also facilitated the spread of false rumors and tales. Another Lily tale asserts she was indeed born at the hospital, to a mother who couldn’t care for her. Beloved by the staff, Lily lived her short life inside the walls of TALA until her death at age nine from complications of pneumonia. Many similar stories circulate within the paranormal community, with wavering details but consistent basics. Where is the truth, if any, in Lily’s story? Are there slivers of fact intermingled with these elaborate accounts? Did she die there? Did she ever live there? Myth or mystery, what does remain is the evidence, the accounts, the EVP’s all suggesting that a small female child who goes by the name Lily roams the halls of the Trans Allegheny Lunatic Asylum, making her shy and yet playful self known to visitors who come to meet her. Lily speaks, and as long as she has something to say, we will listen, regardless of her terrestrial origins.